Do you know the immigration story of one or more female ancestors? Do you have any passenger lists, passports, or other documentation? Interesting family stories? I don’t have any immigration stories, passenger lists, passports or even the names of the women who came to the United States, probably in the 18th century, against their will from Africa. Until I took an mtdna test several years ago and persuaded my father’s sister to do the same I didn’t know what part of Africa they were from. 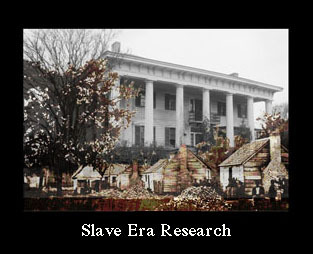 We have no oral history of the Middle Passage. In 2008 my sister received a free mtdna testing kit from African Ancestry. Since she wasn’t interested, she passed it on to me. The results came back L3e for the haplogroup and they said I shared dna with the Mende people of Sierra Leone. 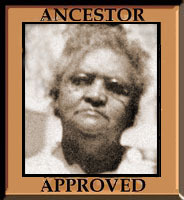 Later I decided to test again with Family Tree and my father’s sister also tested. My results came back L3e3*. My aunts came back L3e2*. They said her results were the same as a broad area of Sub-Sarahan Bantu speaking groups. In 2011 23andMe had a free offer to entice more African Americans to test and I took it. The results came back L3e3b. Neither of these testers were so specific with a group as African Ancestry was. They were more general, saying that L3e3b is one of the Sub-Saharan groups. One said they had matches from both Sierra Leone and Ethiopia. One map I found shows the group originating around Ethiopia and migrating out towards West Africa. 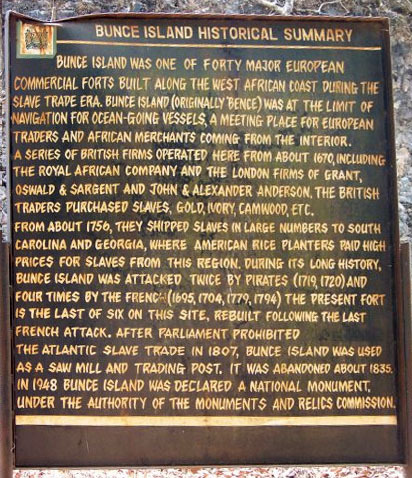 Reading online I found that most African Americans in the United States left from a fort on Bunce Island in Sierra Leone. The photos on the left of the the montage show the fort back when it was being used and then the overgrown, green island and fort as they are today. I also found that most slave ships coming into the United States docked on Sullivan’s Island outside of Charleston, South Carolina. The people were sold at auction on the north side of the Exchange building in Charleston, shown on the far left side of the photo. 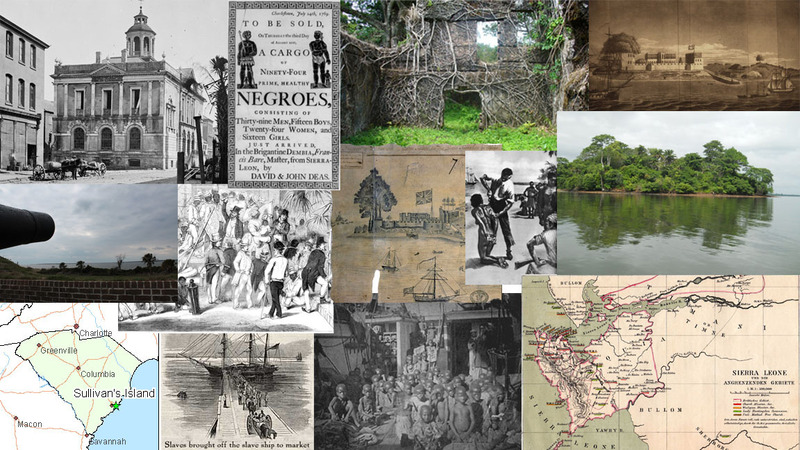 Other photos include maps of Sierra Leone and Charleston/Sullivan’s Island, an actual photograph taken in the 1800’s aboard a slave ship, and an old drawing of the auctioning off of slaves. In 1974-1975 my family and I lived in Mt. Pleasant, right outside of Charleston. My husband was working for the Emergency Land Fund trying to help black farmers save their land. We often went swimming at the beach on Sullivan’s Island, without knowing that our African ancestors probably landed near there after crossing the Atlantic ocean during the 1700s. When my oldest daughter was born in 1970 we decided to give her a family name and an African name. I picked a name out of a children’s story we had in the Black Conscience Library. The name was Jilo. We could never find out what kind of name Jilo was or what it meant. After I received the information that Eliza’s line went back to the Mende people of Sierra Leone, I found a list of names and found that the name Jilo comes from Sierra Leone. 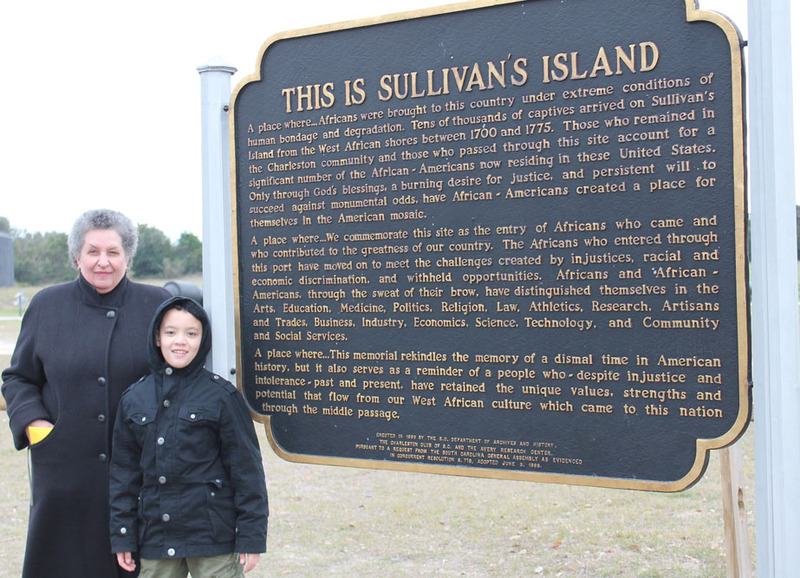 In the spring of 2013 my daughter Ife, her two children and I went to Sullivan’s Island, South Carolina, to see the place where the slave ships landed. Sanding with my grandson next to the sign on Sullivan’s commemorating the entry site for the thousands of Africans that arrived through that port. To see photos of my mtdna line click My Matrilineal Line and More. I like how you did this…So many of us just say we are from here because it is so difficult to link our immigration to the U.S. because of the Slave Trade. Thank you to opening my mind and not being fearful of sharing the story and acting like we were always here. You did an excellent post!! Thanks Yvette! I think one important thing to remember is that we weren’t immigrants and we didn’t immigrate. We were brought here against our will, which does make for a different story. And even though we weren’t always here, the only stories most of us have are from here. I hope to go back to Sullivan’s Island soon and look at it through different eyes. Your research is, as always, amazing! I love following all these wonderful posts about your family. Thank you!! Once again you’ve knocked me flat, Kristin. Outstanding. Just the thought of your family playing at Sullivan’s Island provokes so many responses and emotions. Yes, Susan. Pretty sad to not have a clue. Sad, yes. But also wonderful that you could play and enjoy one another. Perhaps a small comfort to those souls that suffered so much to know that your lives are better. Amazing research Kris. We were living in Wilmington, NC during the same period of time and never realized that you were in the Charleston area. Del and I traveled to Charleston on business. That is sad too, Delores. We would have been so happy to see you! I’m hoping one of the cousins from Aunt Josie’s line will get tested so we can follow that mtdna back to Africa. As always your research and amazing posts really touch places way down deep on the inside of me. Just gets your full attention and makes a lasting impression, with reality check and all. Thanks so much for this post, Kris. Ellen, I really appreciate you saying this. Sometimes when I finish a post, like the one above I think, no one is going to find this interesting. I breath a sigh of relief when people tell me they do. Everyone who has commented already has put so well into words how I feel when I read your posts. Excellent post again. Kristin, Let me tell you why this post was SO POWERFUL! You engage us with these questions: Do you know the immigration story of one or more female ancestors? Do you have any passenger lists, passports, or other documentation? Interesting family stories? Immediately, my mind started trying to come up what kind of documentation I have. It didn’t take long for me to realize that you could not do the same. I don’t know how you do it post after post — but I am so grateful for you. When I read those questions in the Fearless Female prompts, I knew I didn’t have anything and at first I didn’t plan to do it because of that. BTW — I hope you link this post to Mosaic Monday, too. Love the collage. Kathy, I haven’t linked to Mosaic Monday because right now I just don’t want to take on another thing. Maybe later. Something that I forgot to put in the post but will probably add was that when my oldest daughter was born in 1970 we decided to give her a family name and an African name. I picked a name out of a children’s story that I had. The name was Jilo. We could never find out what kind of name Jilo was or what it meant. After I received the information that Eliza’s line went back to the Mende people, I found a list of Mende names and was surprised and moved to find that Jilo is a traditional Mende name. I’m glad you did decide to do this. The CONTRAST between those of us who have half a chance of getting documentation with those of us who have no such opportunity is so stark. If you hadn’t written the post, we may have not realized how unreasonable the prompt was for some of us. so interesting that Jilo was a traditional Mende name. An amazing story… I love that you named your daughter Jilo and then found it was traditional. I love that you had the courage to pursue as much knowledge as you can about this inheritance. We do too. It was so surprisingly (to me) moving to find a specific place of origin and to find Jilo was connected… I don’t think it was courage to try and find out as much as I can. I just want to know, I have to look. I guess it’s the same as anyone looking, maybe harder as I go back and there are no records. Anyway, I don’t feel brave about it. Amazing Kristin. I read it over twice to ensure that I didn’t miss anything. I got a shiver reading the final paragraph. How wonderful that your daughter’s name originates from the area where your family originated. Sometimes there can be too many “coincidences” and it makes me feel that there is more to it? I agree. I feel the same way. WheW Kristin! Loved it your Piece! It’s amazing the things that tie us to the Past just as Great as Gifting the Name Jilo! That was Amazing how the Ancestors get our attention, and to go back there. I hope I get the opportunity real soon to Go….. Woman Warriors! It was so cold the day we went. I can just imagine how cold it would feel to someone coming from Sierra Leone. Kristin, I have truly enjoyed the way you and all of the bloggers participating in this year’s blogging through the series with “Many Rivers to Cross” have used your genetic test results to bring your ancestor’s possible – Stolen from African – experience and story to life. Nicely done indeed! I like to think that your Priscilla is well pleased that you named a daughter Jilo, a traditional name from the Mende people. I don’t have documentation nor the DNA information and had decided not to participate. After reading your post and the other posts, I can’t let my Priscilla down, I’ll be participating. A powerful post Kristin.It’s difficult to imagine having enforced “immigrants” in your ancestry though in a different way Australians with convict ancestry have elements of a similar story. They were “lucky” to be very well documented. It’s great that DNA is making steps towards helping you know where in Africa your ancestors came from. 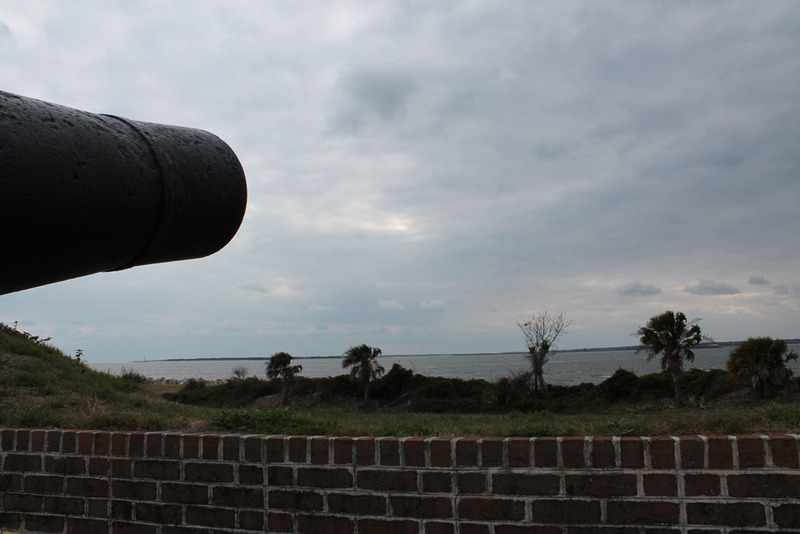 I don’t find it coincidental that you used to visit Sullivan’s Island…maybe other forces were at work.